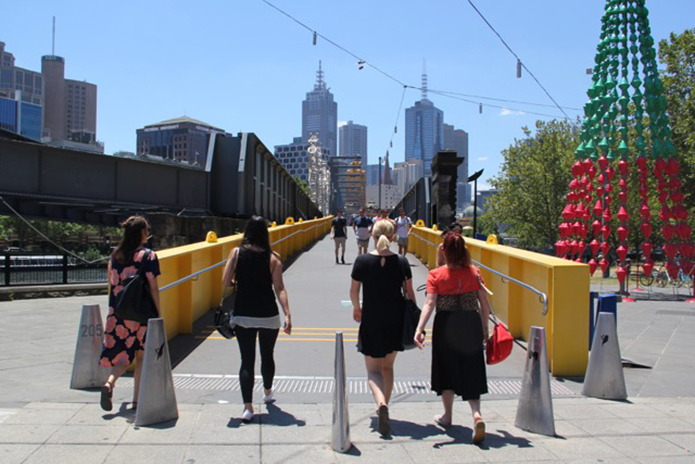 Last Friday some of our team walked from our studio in South Melbourne across the Yarra River to Federation Square on a good will mission where we presented the lovely team at Beyond Words with a big cheque for $27, 101.94. 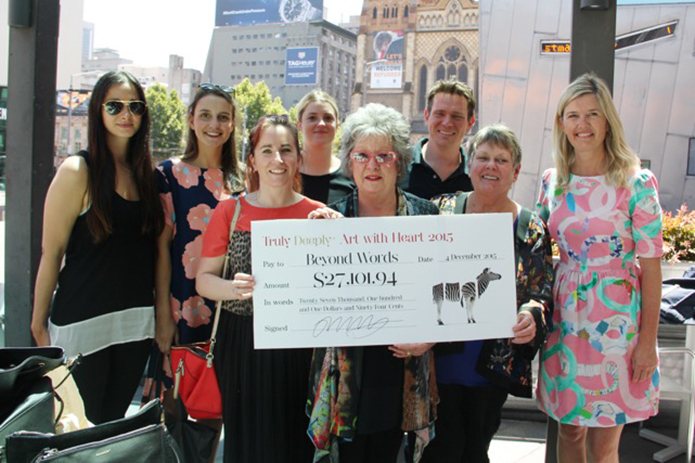 Money was raised from our annual charity event – Art with Heart. This year was our fifteenth art show and a huge success with over 90 pieces of art created, donated and sold to raise much needed funds for Beyond Words. Art with Heart is an annual auction of art created and donated by local artists. The idea was thought-up by us 15 years ago as a way to bring together a community that channels our combined creative energy to raise money for good people who do good things for those in need. Our Director Dave Ansett has always said; “Those of us who run successful businesses have a responsibility to do something positive with that success for the community we live in. Art with Heart is the thing we do”. That is some of our team above with the lovely ladies from Beyond Words in the front middle – Wendy Shiels and Carol Walker. We are all very proud of the efforts of everyone involved in this years show from our Artist’s, Sponsors and all those that attended the event or successfully bid on artwork. A very big thank you to 3M for the adhesive hanging strips and John Woolley at O’Connell’s for supplying the booze. 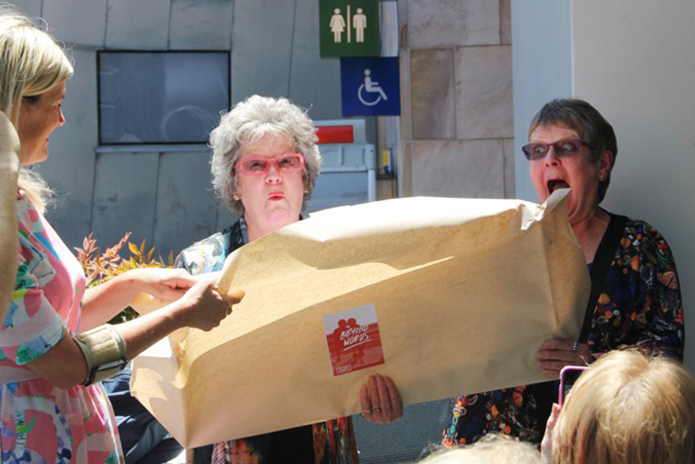 Beyond Words is a not-for-profit initiative based in Melbourne whose goal is to celebrate and value the rich lives of older people in our community. 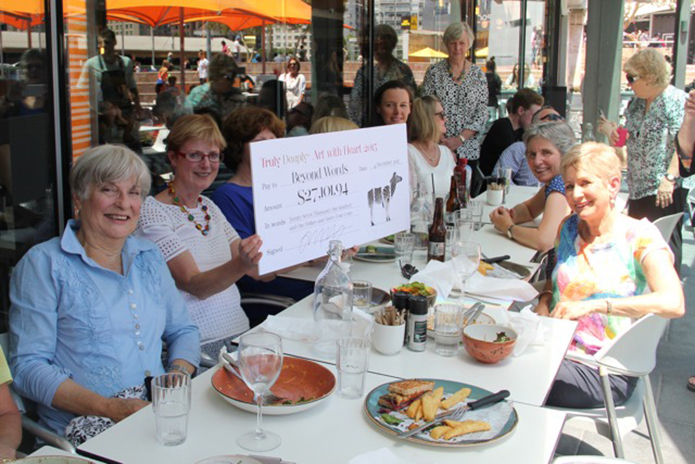 Their mission is to recruit; train and support volunteer biographers to help people in aged care capture their life’s memories. More than producing books, their community of volunteer biographers helps people in aged care tell their life stories. They listen, transcribe, edit and publish these wonderful stories to share with family and loved ones. The process is simple and life changing for everyone involved. It was such a pleasure raising funds for Beyond Words and handing over the ‘big cheque’ last week. It really is beginning to feel a lot like Christmas.